Masonry heaters are extremely efficient wood burning devices. In fact, they can reach efficiencies of more than 90%. In my opinion, they are probably the best way to heat with wood. The design evolved in northeastern Europe centuries ago. Long winters and scarce fuel created the need for efficient heaters. The result was the evolution of masonry heaters. These heaters work on a different premise than either a wood burning stove or fireplace. Fireplaces and wood stoves burn continuously to provide heat. Masonry heaters typically only have a fire once or twice a day. The basic idea is to have a large mass of masonry absorb heat completely from the fire, then radiate it slowly into the room after the fire dies down. Two basic design principles contribute to the heater's efficiency. One is a secondary combustion chamber. Typically, this will be directly above the primary firebox. As I mention on the Wood Burning page , as a log burns various resins vaporize. These resins ignite at different temperatures. In a slow burning fire, the temperature may not become high enough to ignite all the resins. The resins then pass out as smoke. This is undesirable both because it represents heat loss and air pollution. The fire in a Russian fireplace heats the secondary combustion chamber to a high enough temperature to ignite all resins in the smoke. The temperature in the secondary combustion chamber can reach 1800 degrees or more. The combustion of all resins means not only will the maximum amount of heat be released from the wood burned, but also that there is very little pollution. The other major feature of a Russian fireplace design is that the exhaust from the fire passes through a maze-like series of baffles before exiting the chimney. This allows transfer of all the heat produced by the complete burn to pass to the masonry mass. The smoke path doesn't have to be as convoluted as the one in this diagram, but it gives you the idea. When the fire burns down this stored heat gradually radiates back into the room. Because of these design features, you can burn wood with 90% efficiency. Some heaters claim even higher efficiencies! As all the different names I listed above suggest, there are many variations of this basic design. 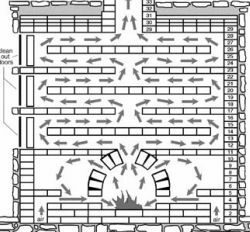 Many of the variations have to do with the smoke path and firebox size. For clarity, here’s the Masonry Heaters Association’s definition. A masonry heater is a solid-fueled heating device constructed mainly of masonry materials in which the heat from intermittent fires burned rapidly in its firebox is stored in its massive structure for slow release to the building. It has an interior construction consisting of a firebox and heat exchange channels built from refractory components. Potential downsides of Swedish stoves and other such heaters include their mass, expense, restrictions on home design imposed by the heater and difficulty finding a qualified mason to build one. The weight of the heater requires a strong foundation designed to support it. This means a masonry heater usually isn’t suitable as a retrofit. Any of these type units need to be built properly to function well. As the description above indicates, the smoke path is quite convoluted. Constructing it on-site is time consuming and a true test of a mason’s skill. Unfortunately, such skilled craftsmen are in short supply. If you find one, you can expect to pay for quite a few hours of their time to construct such a complex heater from scratch. Prefab units partially solve this problem. These units are produced by several different companies. They typically consist of a masonry or stone core that is constructed in modules at the factory and then assembled on site. Some have a finished exterior. Others allow the homeowner to finish the heater with stone or brick to fit the design of their home. Prefab units still require a strong foundation and the skill of a mason to assemble, but the complicated combustion chamber and smoke path, the most difficult and time-consuming part of the construction, are done at the factory. This means the homeowner can count on the heater working well while saving some money on labor. Using these wood burning units puts some restrictions on a home’s design. This type of heater work best in homes with a fairly open floor plan so the warmth from the heater can circulate freely. 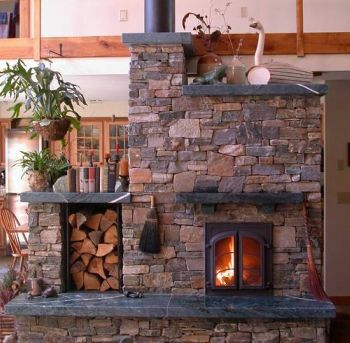 When designing a home to accommodate a masonry stove or heater, the stove should be in the central part of the room. This lets the retained heat radiate from all sides. It would make no sense to have the masonry mass extending beyond the outside wall as architects often do with traditional fireplaces. Some people may not want to have a block of masonry as a focal point of their home. Obviously, this is a matter of personal taste. Personally, I find the combination of beauty and efficient function of a masonry heater to be extremely attractive. If I ever find myself building a new home, it will include a masonry heater. It will probably be a prefab with a custom finish (unless I happen to find a true artisan mason to make it for me). If you’d like to see more of what some of these heaters look like click here to go to the Pictures page.